It seems like just yesterday that we were all excited about the League of Legends World Championship kicking off. It’s been a wild ride, and we’ll be looking back on some of the events from this year for a long time. Whether you were cheering for Albus NoX Luma’s wild ride through groups, hoping and praying that Cloud9 could make it through, or mourning the collapse of G2 Esports, there’s been no shortage of thrilling tales. Unfortunately, as the tournament progresses, the weak fall away and only the strongest teams are left. This weekend, we’ll be watching the semifinals. Two best of five series, four teams, and two fantastic stories. Let’s take a deeper look at the narratives beneath both these storylines as we prepare to weed down the final four for the upcoming finals. On one side, we have H2K. H2K are Europe’s third seed, a team who had to fight through regional qualifiers to make it to Worlds, and a team expected to remain in the shadow of G2 Esports. H2K had gone through its share of chaos during 2016. ADC FORG1VEN had faced conscription into the Greek army and later left the team, there were rumours about the disputes that had led to him leaving for Origen, and Freeze was drafted as his replacement. Things didn’t work out between Origen and Forgiven, and Freeze stepped aside with an industry. The prodigal son was welcomed back to H2K and, well, forgiven. From there, the roster have battled their way to the top four. At this point, they are the only western team left standing, while Korean teams hold the remaining three slots. H2K are on a hot streak, winning their last seven games in a row. They have strong laners, but their standout star is Jankos. They call Jankos the First Blood King thanks to his early successful aggression. There are doubts surrounding the European squad, however. H2K didn’t face a Korean team in their group, which gave them an easier road to the quarterfinals where they faced Wildcard team Albus NoX Luma. ANX have discussed how their schedule of CIS playoffs, then the Wildcard qualifiers, and then Worlds left them exhausted. Have H2K been successful because of chance, or because of skill? Samsung Galaxy will answer that question. The team is Korea’s third seed, and they stood in the shadow of the Tigers and SKT during this tournament. They’ve been building momentum since their debut in the LCK, transforming from a team with communication and synergy issues to a legitimate threat. This tournament has been no exception. Samsung only dropped one game in Groups, and have won all seven games since then. They’ll be hungry to prove themselves as a top team, and making it to the finals is the perfect way to do that. This clash will be a test between two teams who are hungry for recognition and growth, but only one team can only advance to face the winner of the next matchup. Forget TSM vs. CLG—this is the biggest rivalry in esports. SKT is the top team in Korean history, and behind them is the ROX Tigers. 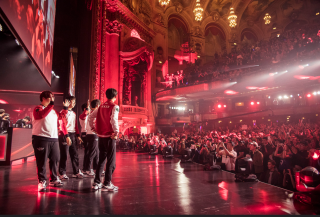 SK Telecom T1 is a dedicated squad with financial and infrastructure advantages that have allowed them to dominate so long and consistently. The ROX Tigers have struggled to find that same financial stability, but they have excelled regardless. During their progression and growth, they’ve been called the world’s best team. This summer, they finally claimed the top spot in the LCK. There’s just one barrier left in their path: SKT. SKT has won four series against ROX; ROX has never been able to claim a series against SKT. Even though ROX won the LCK, they didn’t have to defeat SKT to do so. SKT fell in the summer playoffs to KT Rolster, and ROX were able to defeat KT Rolster. This clash of the titans will be on the world stage, and even though ROX look strong, there’s still that nagging doubt that SKT are going to walk away from this series with a fine collection of tiger pelts. This is the moment where ROX have the best chance to overthrow SKT. They’ve been the tournament favourites up to this point. Their top laner, Smeb, is rated as the best top laner in the world. That’s a massive advantage ROX have over SKT, as proven when RNG’s Looper managed to gain massive advantages in the top lane. RNG quickly learned that SKT have a slow start to their series, however, and losing one game early on doesn’t mean that they’re down for the count. SKT's threat level ramps up over a series, getting progressively deadlier and more calculated. SKT and ROX have different playstyles, and it’ll be interesting to watch those styles mesh during this semifinal matchup. SKT, as mentioned above, slowly improve over time. They play a cerebral, careful game of meticulous League of Legends. The ROX Tigers, on the other hand, stand apart from their Korean peers. The team works together very well. They call themselves the ROX Tigers not because of a sponsor, but to celebrate that team unity—they fell together like a pile of rocks. This synergy allows them to make jaw droppingly aggressive plays and apply pressure to an opponent, squeezing them out so the Tigers can focus on collecting advantages around the map. Only four teams remain as we head to Madison Square Garden in New York City for the semifinal games. Only two will remain standing after all is said and done. Will there be a Western team in the finals for the first time in recent history? Who will win in the clash between Korean titans? Both semifinal series have some fascinating narratives leading into them, and the result should make for some great League of Legends.